Stockholm is the capital and largest city in Sweden. The inner city has 14 different islands that are connected by bridges. It's a truly unique and cosmopolitan place to visit. There's a fascinating Old Town and there is a significant amount of green space and water throughout. It's really one of the most unique European capitals. Stockholm is not a cheap place to visit and accommodation is no exception. There are a range of unique and interesting hostels that you can choose from if you're on a budget. It's best to stay close to the Old Town, but if that's not possible, it's important to be near public transportation. STF Youth Hostel af Chapman is in the city centre of Stockholm on the island of Skeppsholmen. It's a unique place to stay because it's a ship that was renovated into a hostel in 2008. It's an impressive place to stay and is in a nice spot looking out on the Old Town (Gamla Stan) and the Royal Palace. There are cabins on the ship where guests stay. Each cabin has been restored to its original style. There are also regular rooms available in an 18th century building where you will also find the reception area. This building once served as the firewood storage space for the Royal Castle in the 18th century. The hostel is close to many restaurants and activities. It's also near the ferry access to the island of Djurgrden where the Skansen open-air museum and the Vasa Museum are both found. Staying at this hostel is a unique experience and appeals to travelers from around the world. You're sure to meet a diverse and interesting group of people when you stay here. A good hostel for female travellers, solo travellers, small groups, and couples. This hostel is a favorite for travelers to Stockholm. The location is ideal, in the city center, but it's also in a safe and quiet area. It's about half a kilometers walk to the central railway station and bus terminal. 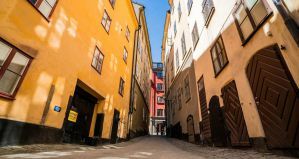 It's also walking distance to many sights around town including the Old Town and the main shopping street of Drottninggatan. The hostel has a social atmosphere and it's the perfect place to stay if you're hoping to meet other travelers. The staff encourage guests to interact and there are several common areas where you can relax with other travelers. There are lounge areas with satellite tv, a book exchange, and a hot sauna that you can enjoy. There's also a full kitchen which guests can use to prepare meals as well as a breakfast cafe where you can enjoy food. The staff organizes various events for guests including preparing Swedish Meatballs once a week. They also organize various tours and activities for guests including guided bike rides and a Viking Sauna Tour during the winter. Both private rooms and dorms are available. Private rooms are twins. There are also six bed apartments available if you're traveling with a small group. Dorms sleep four, six seven, eight, or twelve people and both female only and mixed rooms are available. Jumbo Hostel is another unique place to stay. It's the first hostel that's found in a 747-200 Jumbo Jet and it is truly a one of a kind experience. The hostel has 29 rooms that range in size. There are single, double, and triple private rooms as well as two and four bed dorms. The fancier rooms are found in the plane's upper deck and there's a "Cockpit Suite" that has a private bathroom. Each room is about six square meters in size and four meters tall. They are each equipped with their own flat screen tv as well. The hostel is a fascinating place to stay and you're sure to meet some interesting guests while you're here. There's even a bar and restaurant on-site that serves light snacks and drinks. Although there's no kitchen available to guests, there are two microwaves and breakfast is served every morning. The hostel is about a six minute ride from the airport and there are free shuttle buses to the terminals. If you're leaving town on an early flight, then this is a unique and convenient place to stay before you head out. A good hostel for solo travellers and female travelers. Castanea Old Town Hostel is a small and pleasant place to stay in the middle of Stockholm's Old Town. Despite its location in a quaint 1747 historic building, the hostel is quite modern. It's near everything you could want to see and do, but is still on a quiet street in the heart of the city. The atmosphere is friendly and welcoming and the staff are helpful with any travel questions you might have. The hostel has a shared kitchen where you can prepare meals as well as a common area where you can relax with other guests. The hostel appeals to all types of travelers and you're sure to meet a diverse group of people from around the world. Rooms range in size and style. Private rooms sleep two or four people and dorms sleep four, six, or sixteen. A female only room is available.